Tonight is a rehearsal night, which means I didn’t have much time to make anything complicated, so I made Lemon Snowball Cookies. I stumbled across this recipe a few weeks ago, in King Arthur Flour’s social media feed, and have been looking forward to trying them ever since. They have some similarities to Mexican Wedding Cakes, but these don’t have crushed nuts. They go together pretty quickly – just cream the butter and zest a lemon, and add in powdered sugar and a couple of other ingredients. Once out of the oven, they cool for a few minutes, and then get rolled in powdered sugar. 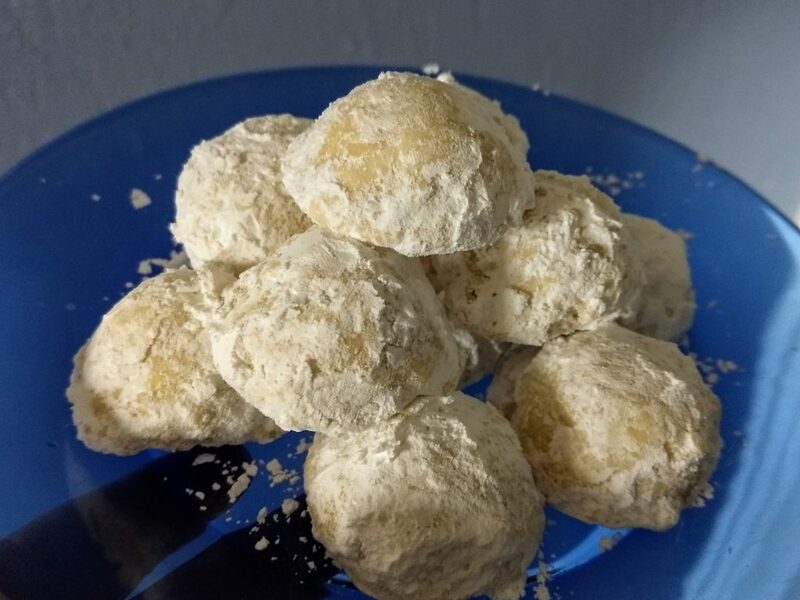 The recipe calls for the addition of lemon powder to the powdered sugar coating, but I don’t have any, or know what it is, and since the primary goal is to use up actual lemons, not lemon substitutes, I just ignored that bit. They are delicate, and a little bit crumbly, and there’s a light lemon flavor that gives just a hint of brightness without being overwhelming. Over all, they are a perfectly acceptable cookie. Will I make them again though? Eh, probably not.